After my last post, I realized it wasn't fair not to give my other major green collection a little nod today. 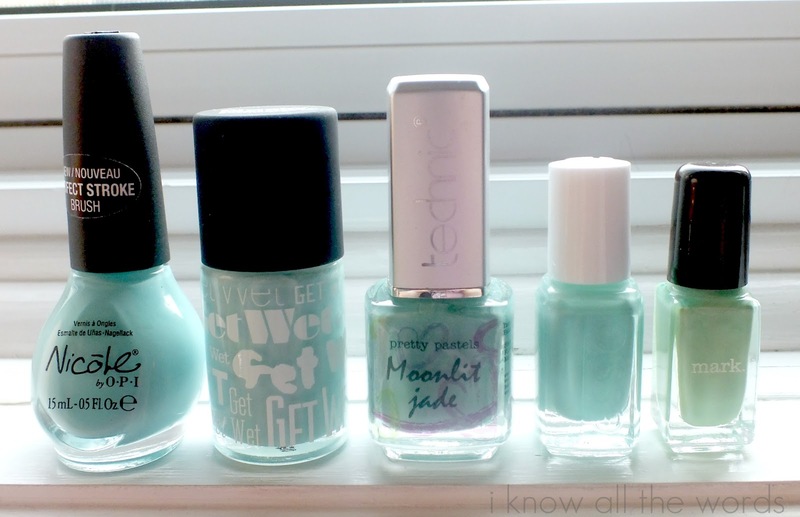 Nail polish! As I've said green is my colour... I mean take a look at my bedside table. You don't get much more green than that. I love green nail polish. I've said (numerous times?) that I could seriously marry OPI Jade is the New Black. I love it that much. There is one more polish I just realized I left out of this little green love-fest: China Glaze It's Alive. Poor guy, left out of the fun. Click images for full size. Everybody got a little nap in before going back to the drawer. I'm an awesome polish parent. Do you have a fave green polish you'll be sporting today?